(A number of years ago I had a client who had ‘tennis elbow’ it had appeared out of nowhere (she did not play tennis) she had tried the anti inflamatories, she had tried physio and it was getting so bad that the doctor had suggested an exploratory procedure to see what was happening in the elbow. I saw her about a week before the op. Ostensibly to prepare her for the operation. The BodyTalk techniques provide insights to the areas of your body that need attention. What might seem like an obvious problem to you is not necessarily the one your body wants to address first. The client lies fully clothed on the therapy bed and the practitioner uses the clients wrist to gage the responses from the body. We use the simple Kinesiology muscle testing technique to do this. 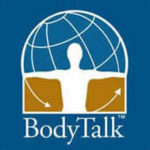 The beauty of BodyTalk is that it respects the body’s own needs and determines your body’s priorities for healing. Then with the use of a variety of non-invasive techniques, BodyTalkers refocus your body’s natural healing response to establish better communication within the body. Health challenges arise for a variety of reasons. When a practitioner is trained to look at the whole-person, emotional, physical and environmental influences – the true underlying causes of dis-ease can be revealed.